Citing sources close to the matter, Bloomberg reports that ARKit 2.0, arriving with iOS 12 later this year, will include support for multiplayer experiences. If true, this announcement would not only corroborate reports from earlier this year but also match capabilities that Google launched at its IO developer conference last month with its Cloud Anchors platform. It is not clear, however, whether Apple's flavor of multiplayer will have the cross-platform qualities of Cloud Anchors. While Google has a headstart on multiplayer, the uptake from developers has not yet materialized. Google just recently pushed out the first app to support Cloud Anchors via an update to the Just a Line app for Android and the launch of the same app on the App Store. So, if the AR toolkit development race is a marathon, Google's lead could be measured in yards rather than miles (or meters and kilometers for the metric world). But Apple is just catching up with multiplayer in ARKit 2.0. The same report reveals that Apple will also bring persistence to mobile AR experiences in iOS 12, a feature which would leapfrog Google and ARCore. 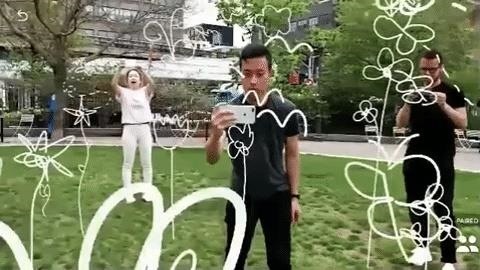 The combination of multiplayer experiences and persistent content would not only be a huge leap forward in capability for ARKit but also a step closer realizing the AR Cloud for which augmented reality proponents salivate. Finally, the report also mentions that iOS 12 will update the process for sending Animoji. Hopefully that means the feature will be unshackled from the Messages app, but we don't know yet. For any more details, we'll have to wait until WWDC next week, or more anonymous sources to come forward.